Frag videos mean a lot of different things to people. For the uninitiated they’re dubstep messes of lucky shots and one-ofs. To the more invested, the best are music videos combined with memorable moments and massive displays of skill. However, they’re very rarely movies unto themselves, with the production values of a Marvel flick and so much sprucing up of the game in question – CS:GO in this case – that its maps, models and gameplay are barely recognisable. Such is the work of YouTuber Nicole “NikkyyHD” Hawkins and her latest piece, Clockwork 4. 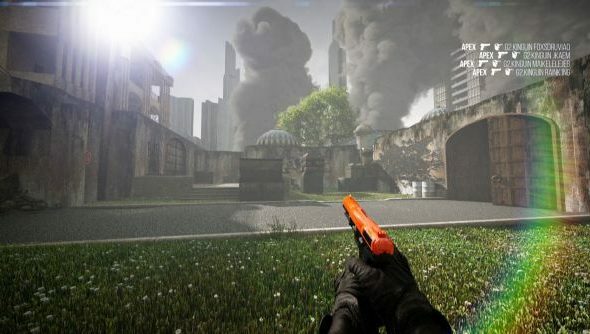 The best FPS games all look great when edited like this. Having watched many, many hours of CS:GO, it still took me a while to work out what maps some of these shots are even on. Roughly half of the six minute video is entirely custom content, with the rest being so heavily edited only the frags themselves are from the actual game. In case it needs explaining, no, Dust 2 isn’t set in some combination of night-time wasteland and sunny field, nor do whirlwinds regularly pop up on Inferno or players toss teleporters on to the ground to move between maps. The commentary and kills are real, most of the rest is not. If, like me, you weren’t entirely sure which bits were where, this handy imgur album from Reddit should keep you straight. Also usable as wallpapers, if you’re so inclined. As for the creator, NikkyyHD is a professional animator and video-maker that does contract work. She’s been creating frag vids like this for a couple of years, most notably a Call of Duty movie titled Pamaj after the player it stars. She’s also done some entirely custom work for League of Legends. Hit up her channel for more. While we’re here, this is still the best frag video of all time, in case you were wondering. In other CS:GO news, ESL Pro League Season 3 finished up yesterday, and game 5 of the grand final between G2 Esports and Luminosity Gaming is a must watch. It’s a long ride but settle in for some wonderful Counter-Strike.